Kanter got mad that he couldn't use this roster to pad his stats and get a big deal next year. On top of that, his numbers be empty as hell. He gives away more than he scores. **** Kanter. He's still talking about it like he got a raw deal here. They didn't have to give him the buyout. Could be that no one wanted to trade for his expiring though without dumping salary. What does that say about Kanter. Master Zik, don ramon and the 718 truth like this. don ramon, the 718 truth, floodarea and 2 others like this. His stats are same on the Blazers tho. He just didn't work out here when Knicks changed direction. I doubt he gets as big a contract in the off season tho. Tbh, Kanter is a guy that you want on your team though. Very good rebounder and can score inside. Not saying he’s 30mil guy, but can easily fill that sixth man roll. He’s the Derrick Favors/Al Jefferson type. Once we got DJ, Mitch started playing better. It might be a coincidence, but that's how it played out. Not the way dude be talking. He knew how bad we were going to be and dude decided to OP in. However, he probably didnt think the season for him would unfold how it did. But it can be a mutual feeling which is fine, it's just that Kanter still salty. Funny thing with Kanter is dude is flexing because he had one good playoff game and his team won by 5 against a team that went 5 for 33 from 3.
don ramon, floodarea, the 718 truth and 2 others like this. Nah, I don't think Kanter would have opted in if he knew he would be benched. His problem wasn't so much the losing but that he was benched. He knew how bad the team was way before he knew he wasn't getting any pt. If he can have a successful playoff run he can Jerome James someone in the off season. Did Kanter really think we would prioritize his next contract over Mitchell Robinson’s development who is probably already a better all around player and would likely be a top 5 pick if the draft were redone? Mitch just got a crush on DJ. Mitch probably doesn't know DJ is on his team. 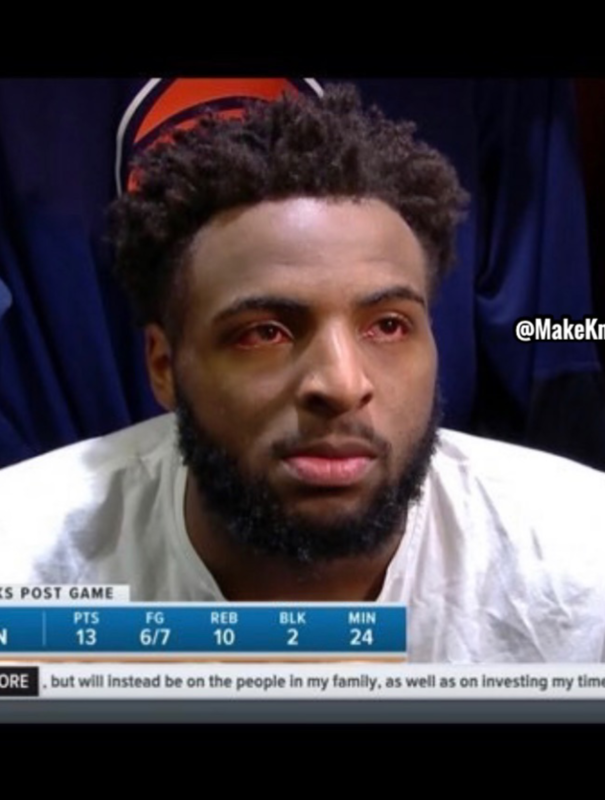 Son is always blazed. I'm sure of it. Master Zik, don ramon, the 718 truth and 1 other person like this. I could definitely see people not messing with Trier. That whole iso-Zo **** was overblown. You could tell he was feeling himself with some of those iso drives he decided to take. don ramon and Upptempo like this. don ramon, donewithjs, floodarea and 4 others like this. Damn has Trier already ascended past JR Smith? debso, Master Zik and Hahahaha like this. debso, floodarea, Hahahaha and 1 other person like this. redd spyder, harlemtothebronx and donewithjs like this.